To many, Gino Bartali, Fausto Coppi, Felice Gimondi, Francesco Moser, Dave Stohler, Gianni Bugno, Ivan Basso and Vincenzo Nibali are all famous Italian cyclists from the 1940s to present day, elevated to legendary status based on their exploits in the Giro d'Italia or on the cinder track at Indiana University. Wait, did I include Dave Stohler? Indiana? Yes, for several reasons. The fictional main character in Steve Tesich's 1979 Oscar-winning movie Breaking Away brought the cycling community's infatuation with Italy to the masses as disco was slowly dying. The 24-year-old actor Dennis Christopher portrayed Dave, while up-and-coming actors Dennis Quaid and Daniel Stern made their Hollywood debuts as his high school pals looking at their dull futures in Bloomington, Indiana, based on Tesich's time at the school in the early ’60s. With Breaking Away, Americans caught a glimpse into bicycle racing, with its homage to Italian brands like Masi and Campagnolo, wrapped up in a teenage narrative with love, angst, desperation and family ties. And to the horror of many Midwest fathers, the idea of their sons shaving their legs. Dennis Christopher was born Dennis Carrelli in Philadelphia; his performance in Breaking Away, directed by Peter Yates, won him the British Academy of Film and Television Arts (BAFTA) Award for Most Promising Newcomer and the Youth in Film Award for Best Juvenile Actor in a Motion Picture, as well as garnering a Golden Globe nomination. The $2.3 million movie, filmed in Bloomington in the summer of 1978, did well at the box office, garnering $20 million. As for the ill-fated television show in 1980? Well, at least the producers hired ’70s teen heartthrob Shaun Cassidy to play Dave Stohler; who could resist the doe-eyed charm of Partridge Family matriarch Shirley Jones' son? 1. The Little 500 bicycle race that forms the centerpiece of the movie's plot is a real race held annually at Indiana University. The Cutters team of Stohler and his pals was based on the 1962 Phi Kappa Psi Little 500 champions, which featured student racer and Italian enthusiast Dave Blase, who provided screenwriter and fellow Phi Kappa Psi team member Steve Tesich the inspiration for the main character in the movie. Blase, together with team manager Bob Stohler, provided the name of his main character. In the 1962 race, Blase rode 139 out of 200 laps and was the winner, much like the main character in the film. Blase himself appears in the movie as the race announcer. 2. Despite little cycling experience, Christopher did most of his own riding in the movie. "The bike stuff was very challenging to me because I wasn't a sports-minded person when I was in school," he said in a 2012 interview. "I didn't really have time for a lot of training, and I thought, 'How can I become a bike champion in a few weeks?' But they had a great double for me — his name was Garry Rybar and he was a champion bike racer — and I matched his style on the bike. Even though I might not have been going 60 or 70 miles an hour on the bike, I knew what it would look like on my face and my body to go that fast. It seemed to work out. I'd say they ended up using maybe 85 to 90 percent of my stuff in the movie as opposed to the double. There's a couple of shots where you see massive calves; that was not me." 3. Stohler stunt-double Rybar was an excitable and experienced Indiana bike racer, tickled to be given a spot in the movie. "I was told I'd probably be needed to double in a road race sequence, in the final Little 500 race sequence, and definitely in the scene where Dave Stohler drafts a semi truck at 60 miles an hour, and could I do it?" he said. "On a training ride in Florida I got in behind a motorhome for a good many miles, settled in at about 45 or 50 mph, and left the rest of the team miles behind. Sixty was still a little in doubt, especially with my injuries healing from a previous accident, but I told them I thought I could, and all the bike stuff was scheduled weeks away. And they were going to pay me for all this, too; I'd have probably done it for free!" 4. Christopher was a quick learner with a natural ability, but Rybar was asked to make sure the star was protected throughout filming. "I was also assigned to tutor Dennis on cycling when we could arrange some time, and so I got pretty protective of him when we went on some bike rides," he explained. "I wanted no falling stars on my watch, because I figured I’d might be out of a job if he got injured and they found someone else. One day I saw him riding out on Tenth Street, with Ted Chase, another Little 500 rider who was playing a frat guy. I was sorta pissed because not even many real bike riders braved that busy stretch of road. But the real surprise was Tesich, who couldn’t seem to get enough time away from the set to reacquaint himself with the cycling venues of Bloomington. A group of us rode down to the quarry as the shooting at the union moved on, and Steve really seemed out to show us that he was a bike rider just like we were, albeit a few years older." 5. 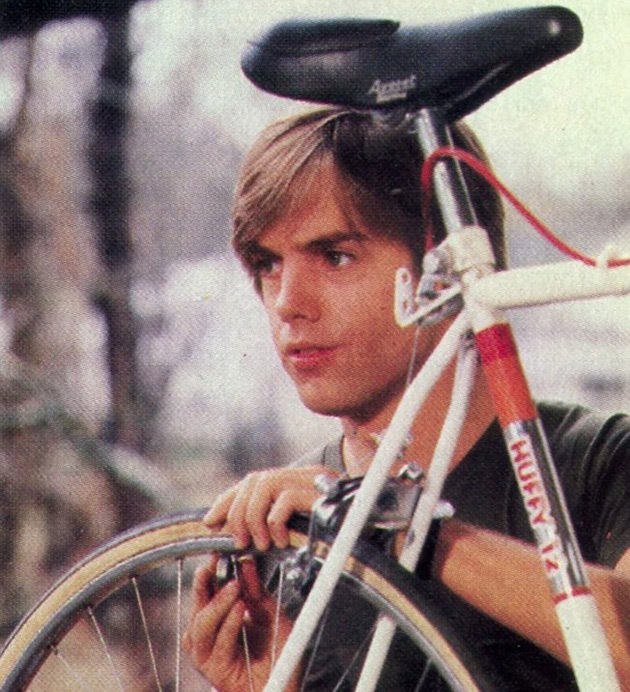 Despite its down-homey nature and sleepy Midwestern setting, Breaking Away received more positive than negative reviews. According to Rybar, the world premiere of Breaking Away was held in the spring of 1979, on Little 500 weekend at the Indiana University Auditorium. "At some point that weekend I was with Tesich and Yates, and everyone just knew by then that the film was going to be a success, everyone except a reviewer in the IU Daily Student newspaper who labeled it 'superficial and trivial'. It was the only negative review it seemed to get, as the national reviews were all raving: 'It makes you glad that there’s both a Hollywood and a Bloomington,' said L.A. Times columnist Pauline Kael. Rex Reed said that the bike racing sequences were 'as exciting as any Olympic footage'. The picture was up for several Academy Awards, including Best Picture and Best Direction, and Steve Tesich won the Oscar for screenwriting; Bill Murray mentioned it on Saturday Night Live as he summed up the Oscar contenders by saying something like 'it’s new, it’s fresh, it’s original and endearing… So it doesn’t stand a chance!'" The television series was also set in Bloomington, Indiana, but was actually shot in Athens, Georgia. The show was caught up in the writers’ strike of 1980 and did not begin production until the fall. Heavily promoted by ABC, it was overlooked by TV audiences and suffered low ratings. It was cancelled after eight episodes were filmed, though only seven episodes aired during its original run.